Select Service Book that had suffix name [CMIME], click the menu button and select Delete. Go to Setup > Email Accounts > Internet Mail Account, select Service Books and click Send Service Books. The final step is to "Register HRT" by navigating menu to Options -> Device -> Advanced System Settings -> Host Routing Table, press the menu key and select Register Now. If that's solution can not fixed your BlackBerry Email problems, there is another possibility why your BlackBerry can not receiving or sending emails. Maybe it's because an error in Email Setup Application (corrupted, incompatible, or update process not that interrupted). This symptom above characterized by not able to access email menu settings (to create or manage email address) in Setup -> Email Accounts, your BlackBerry will stop responding. 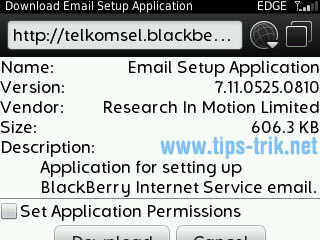 But don't worry you can still fix your BlackBerry Email by reinstalling the Email Setup Application. Click Download, wait until the installation completed and restart your BlackBerry.